Craving something sweet and salty? These handmade salted caramel apple oatmeal cookies from Velvet Rope Bake Shop are a delicious all-American apple pie turned scrumptious cookie. Packed with dried Fuji apples and bits of salted caramel, these cookies are a delectable way to get in your apple a day. 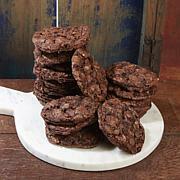 They are perfect for serving at parties, gifting to a hostess or munching at midnight. Plus, since there's no prep work necessary to enjoying these delectable desserts, you can sit back, relax and taste how sweet life is behind the Velvet Rope! Contains or may contain wheat, eggs, milk, soy and/or nuts. Consume within two weeks of delivery or keep frozen up to one month. Ingredients: Rolled Oats, Unsalted Butter, Brown Sugar, Granulated Sugar, Unbleached Flour, Eggs, Vanilla Extract, Salt, Baking Soda, Cinnamon, Apples, Sulfur Dioxide, Caramel (Sugar, Corn Syrup, Liquid Sugar, Skim Milk, Palm Oil, Butter, Salt, Mono/Diglycerides, Natural Flavor, Soy Lecithin). They are really good. I couldn't stop eating them. These cookies are fantastic. They taste great and I would buy them again and again. Not too bad. Would buy again. 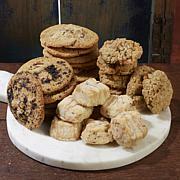 Filled to the brim with your favorite flavors, each cookie tin offers just the right combo of sweet treats. 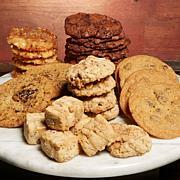 Each tin comes with a dozen delicious cookies, perfect for gifting. What You Get (2) 1.5 oz. Cherry White Chocolate Chip cookies (3) 1.5 oz. 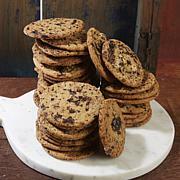 Chocolate Chunk cookies (1) 1.5 oz.